Rural house with many attractions, three dining rooms, a room for events, a spectacular jacuzzi, a game room with billiard futbolint and diana, a wii connected to a giant screen. a dining room and a living room very cozy and bright, rooms with latex mattresses and toilets. 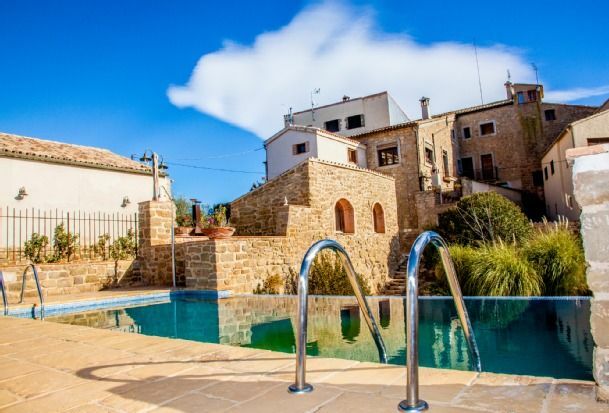 two terraces, a garden with lawn and an overflowing pool, two barbecues one outside, one inside, the village of 24 inhabitants is very quiet and you can do tours and excursions on the paths of the surroundings very relaxing. We can also teach you the tasks of the field, the machinery (depends on the time of year). Estuvimos en Ca l'Albareda con un grupo de amigos con hijos pequeños y fue fantástico. La casa es muy bonita y la piscina se disfruta mucho. El propietario super atento. Seguramente repetiremos! Hemos pasado la semana santa un grupo de 11 adultos y 3 bebes,todos hemos disfrutado muchisimo de la casa,en cada habitacion hay detalles muy originales,el jacuzzi y zona de juegos sin palabras,la piscina y jardin de maravilla.